I've had this topic on my mind for quite some time now and figured that if I kept thinking about it then why not make a blog post? Lately it seems like I've had a crazy amount of studying and school work to keep me busy and constantly focused on how well I'm achieving. I'm one of those people that has to work hard for all of the grades I earn and through that I've learned so many important traits (diligence, time management, how to have a good work ethic, etc) that will be valuable to carry on as I get older. However, with that comes frustration when I see how hard I've worked to achieve a grade I'm happy with and then see someone who didn't study as much or put as much time into a project receive the same grade. I guess that's just how it goes though. We all have different learning styles and ways of accomplishing tasks. A lot of the time this pushes me to work even harder and strive for perfection when in reality I am stating to realize that my persistence is more important than perfection. Perfection is something I feel like lots of people struggle with. Personally, as a perfectionist, I find it hard not to attempt to strive for perfection in just about everything I do. We are all smart enough to realize that perfection is not something that is necessarily attainable and what perfection looks like differs from person to person. While I don't discourage striving for perfection the realization that nobody is perfect and your persistence shows more about your character is something that I try to keep in mind in order to avoid disappointment and become satisfied in my efforts..
With the idea of perfection comes comparison whether in real life or through social media. At Furman (and I'm sure other schools although I have no personal experience with those) I feel like everyone is so engaged in all they do and are constantly involved in just about everything. Sometimes people's involvement and oftentimes over involvement makes it feel as though I am not doing enough. I am a quality over quantity person and would much rather devote my time and hard working energy to a few certain things instead of being sporadically involved in numerous organizations while not being able to commit my full effort. As if while being a student there aren't enough time consuming assignments I spend countless hours attempting to perfect the concept of being incredibly involved seems to linger over my head when I know that adding other things into my already busy schedule would be stressful and not productive. While it would be great to have all of these different organizations to form a seemingly perfect resume the lack of sleep I would loose and stress that would be gained is not worth it for me causing my perfection to look very different from others. Through social media (especially pinterest and instagram and even other blogs) it can be especially hard not to compare your successes to the perfection you think other people posses through brief snapshots of their life. While it would be awesome to have JuliaEngle's hair, countless opportunities for blog posting and sponsorships, Kate's colorful closet, Carly's amazingly cute NYC apartment and pup comparing my own experiences to theirs would be discounting the great qualities or opportunities I have (something I definitely don't want to do). Although if I continue to work hard and be persistent with my efforts the satisfaction that comes with accomplishments is so much sweeter. I feel like I tend to want my life to feel orderly and perfect and who wouldn't want to be great at everything they do but all of those accomplishments take a lot of energy. Since it is so hard to accomplish all of those successes I feel like I put up fronts in order to make it seem as though I have everything together all the time. With that I feel that it causes people to build up facades of varying thicknesses in order to have others perceive them as having their life together. Faking perfection seems to take a lot of energy when that energy would better be suited completing other things. I recently saw a quote that stated that "Perfection is the willingness to be imperfect" (Lao Tzu) and that really struck a cord with me. Transparency can be a good thing and so can vulnerability. Confidently allowing yourself to make mistakes will allow you to take more risks and understand that perfection for you is different than perfection for your friend. I, like everyone else whether it's visible or not, am struggling to manage all sorts of different things such as balancing school work and blogging with social life. Fortunately though, I've begun to realize that persistence is so much more important than perfection. Understanding this eases the stress that comes with school work and everything else and is a reminder that my persistence is more important than appearing to have it all together. 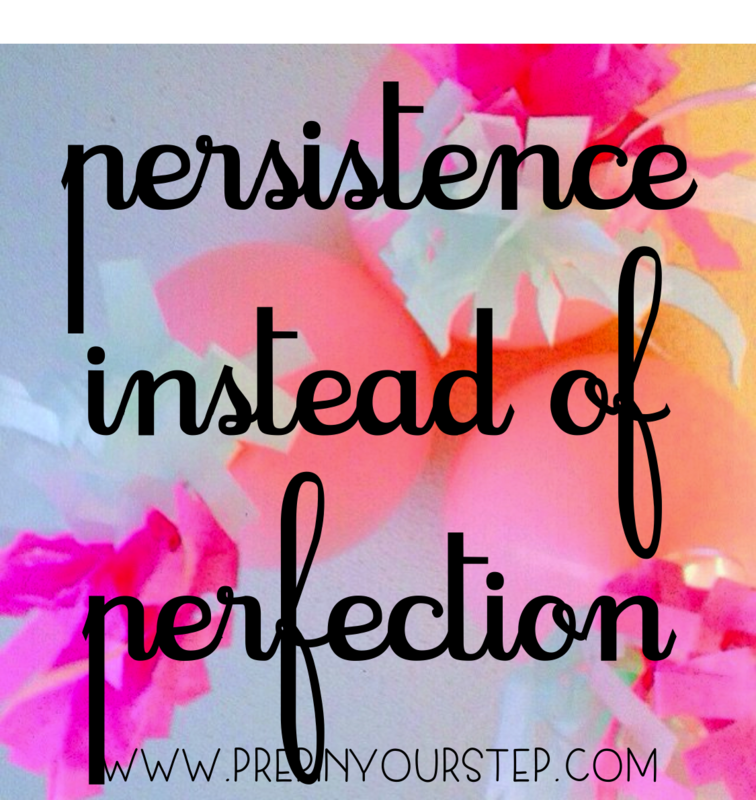 In the long run, understanding the importance of my persistence is going to be more satisfying and a better use of my time than attempting to appear perfect. This is such an important post. Thanks for sharing your thoughts this was really encouraging. Thanks Dorothy for sharing this! I struggle with this as well. It's so easy to look at someone's blog and see their lives as "perfect"
Which post? I would love to check it out, thanks for letting me know!